Welcome to the online shop of Rondeau Production. 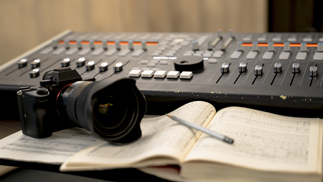 Professional production technology, high standards, and sound engineers with long-standing experience: we are the ideal partner for high-end music productions. Give us a call or write to us. We are very happy to advise you and to make you a personalised offer – be it for a solo recital or a symphony orchestra, a vocal ensemble or large-scale choir, a live recording or a multi-day studio production. Whether it is a concert hall, a church, or a studio: we are very happy to survey the space in advance and to advise you in your decision. It is essential that your recording sounds natural and has space to breathe so that it can surpass your own expectations. We keep an eye on the overall musical shape of your recording. Based on the score and the chosen space, we determine the number and type of microphones most suitable for you. We are musicians ourselves and are here to give you professional advice and support – from the initial contact to the final proofing in our studio. We speak your language and share your goals. Vocal music, symphonic repertoire, and chamber music: we produce high quality recordings for CD, broadcasting, and digital media. We work with renowned artists and enthusiastic newcomers – inspired by a deep passion for vibrant music-making.